Crickets are considered a nuisance pest that occasionally invades dwellings and structures. House Crickets are active at nighttime (nocturnal), which is when the chirping sounds of the male are often heard. The chirping sound is a result of the male crickets rubbing their wings together to attract female crickets. Crickets feed on organic materials, such as plants and dead or live insects, but will eat most anything. Crickets are attracted to lights and often congregate together near lamp posts. Crickets have been known to feed on agricultural crops and a cricket problem may result in damage to paper materials or fabric, such as clothing or carpet. Crickets are especially attracted to clothing items that are soiled with perspiration. Crickets are typically found beneath rocks, garbage dumps and woodpiles and hide during the day in warm, moist locations. A large cricket population can be bothersome during nighttime hours when cricket chirping persists. Crickets usually live outdoors in the warmer weather during the summer months, but may come indoors in cooler weather looking for shelter and moisture. They can often be found hiding in garages or sheds. 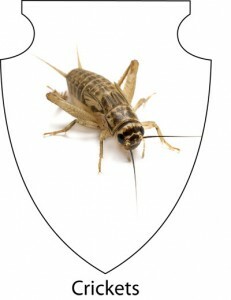 AmeriGuard Pest Defense provides cricket control services. Your service technician will perform a thorough visual inspection to identify the severity of your cricket problem. During the inspection, all sources of the infestation will be identified and methods of cricket treatment will be discussed. The technician will also point out potential cricket harborages and suggest mechanical methods of cricket control where available. A successful cricket control service depends on the cooperation of our customers. One-Time, Monthly and Bi-Monthly Cricket Control Services are available. A General Pest Control Maintenance Plan will include control for crickets on an ongoing basis, along with all other general pests in the outdoor Southern California landscape. What Can You Do to Get Rid of Crickets? Cricket control can be further improved with the assistance of our customers. Below are a few tips a homeowner can perform to reduce the likelihood of a cricket infestation. Contact your cricket service experts at AmeriGuard Pest Defense for a cricket treatment quote. Most quotes for cricket services can be provided over the phone without any obligation. A General Pest Control Maintenance Program will include cricket control on an ongoing basis. No contracts required! Call AmeriGuard Pest Defense at (951) 652-0505 for more information on getting rid of crickets or submit a request using our Contact form online and someone will get back to you to discuss your cricket control needs. Both the inside and outside of your home are always under warranty as long as you continue regular maintenance services. AmeriGuard’s Pest Defense Program guarantees your satisfaction between regular scheduled maintenance with unlimited free re-services. If at any time you find yourself in need of an additional treatment between regular scheduled services, call us and we will return to re-treat your home absolutely free! One-Time, Monthly and Bi-Monthly pest control services are available.